The (ATSP) program challenges Canon Authorized Dealership technical support professionals to confirm their skills and knowledge utilized in the support of Canon Office Imaging Products through a series of exams based upon job functions or role within an organization. The job function-based exams are designed to measure the knowledge and the demonstration of the skills that are required for a support professional against a set of standards for competency and performance. Successful completion of a specific ATSP exam results in Certification of the competencies associated with the specific job function. When a client sees the Canon ATSP logo, they can be assured that the technical support professional responding to their call has the highest industry standard of service certification and manufacturer-backed training to effectively solve any problem. "Becoming the only Canon Solution Provider in the Dallas/Ft. Worth Metroplex to achieve ATSP National Service Recognition Award in each of the last ten years represents a proud moment for our organization. It clearly validates our efforts and commitment to provide superior service and an enhanced total client experience. 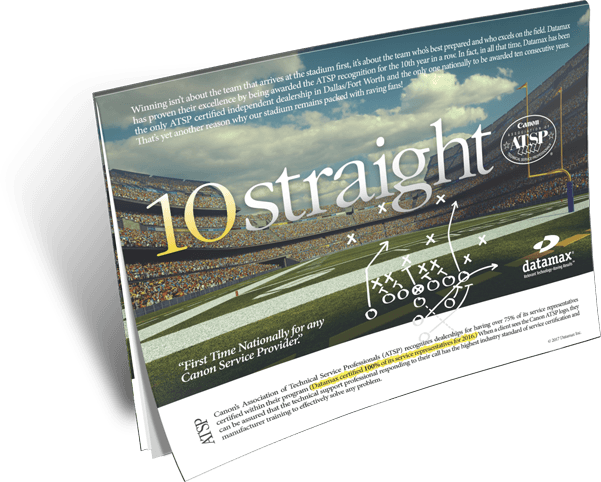 Earning this recognition for a tenth consecutive year, the first time nationally for any Canon Service Provider, really speaks to who we are,” says Henry P. Ledee Jr., Service Training Manager at Datamax. 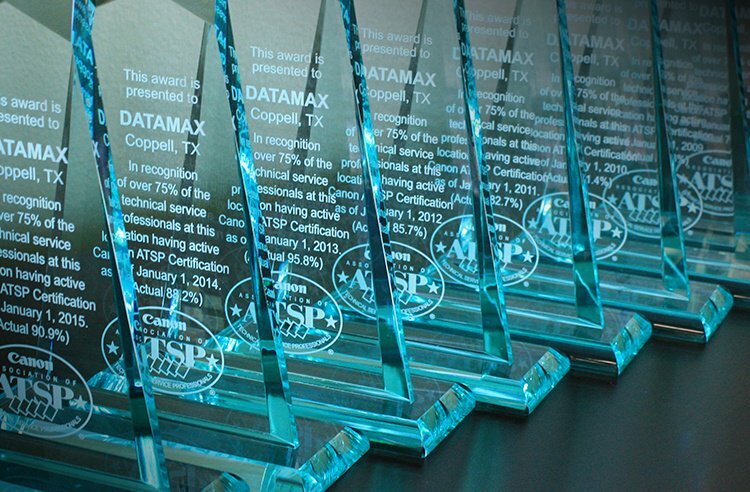 For more information regarding Datamax's (ATSP) National Service Recognition from Canon U.S.A., please contact Henry P. Ledee Jr. at hledee@datamaxtexas.com.